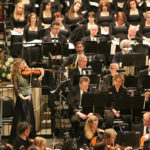 The Memorial evening dedicated to Babi Yar tragedy was the world premiere of Requiem. I was openly excited to have the premiere in that historic location, where the tragedy took place. My father’s family were murdered in Babi Yar by the Nazis in September of 1941, and I was feeling the suffering of this deep personal tragedy when I wrote Requiem. 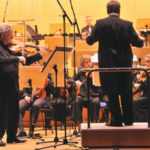 The outstanding performance by violist Rainer Moog and the Symphony Orchestra of National Philarmonic Society of Ukraine, conducted by Roman Kofman, was the best premiere imaginable. I’m sure that the Holocaust Requeim has a great future. Boris Pigovat’s composition is very sophisticated, but isn’t flowery of the pretentious. It is simple but not primitive, it is frank and heartfelt, an outstanding work. Below is a live recording of that outstanding premiere. For years, I felt the necessity to write a work dedicated to the Holocaust. After my immigration to Israel I started to consider different ideas for such a work. 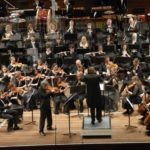 At first, I wanted to write a requiem for the standard orchestration: soloists, choir, orchestra and, maybe, narrator. At that time, Yuri Gandelsman, the principal violist of the Israel Philharmonic Orchestra, asked me to write something for him. He was an excellent violist whom I had known for years – we learned at the same time at Gnessin College and then at Gnessin Institute (Academy of Music). So, when he asked me to write for him a work for viola and symphony orchestra, I suddenly understood – I would write a requiem for viola and symphony orchestra! I would write the work without the text, without the choir and solo singers, but I would try to save the tragic atmosphere of a traditional requiem. 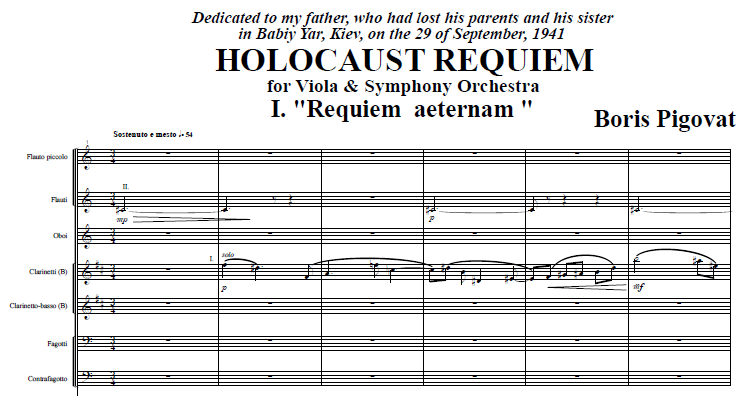 I dedicated Requiem to my father, whose family was murdered in Babi Yar by Nazis in September of 1941. It took me about two years to write it, during which I felt that he was waiting for me to complete it. The day after I finished writing Requiem, my father passed away. In the end, Yuri Gandelsman did not perform Requiem. In October 1995, less than a year after it’s composition, Requiem received the ACUM (Israeli ASCAP) award. 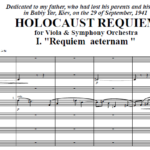 The world premiere of Requiem took place in October 2001, at the memorial evening dedicated to Babi Yar tragedy, in Kiev, by remarkable violist Rainer Moog and the Symphony Orchestra of National Philarmonic Society of Ukraine, conducted by Roman Kofman. 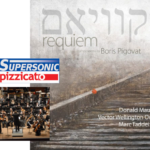 Requiem was performed again seven years later at the Concert of Remembrance for the 70th Anniversary of Kristallnacht, at an outstanding performance by Donald Maurice and the Vector Wellington Orchestra in New Zealand, conducted by Marc Taddei. Later, a live recording was released by Atoll with three more of my pieces. After listening for the Kiev recording of Requiem, violist Anna Serova and conductor Nicola Guerini pushed Naxos to record Requiem. The Naxos compilation includes another piece that I wrote for Anna: Poem of Dawn for Viola and Symphony Orchestra. Both the Atoll CD (in 2011) and the Naxos CD (in 2015) received Pizzicato’s Supersonic Award, and the Naxos CD was also nominated for the 2016 ICMA award. I am honored to have such wonderful performers for the piece! Below is a live recording of the outstanding premiere performed in Kiev and few samples from a performance in Wellington. Additional recordings and information about Requiem performances can be found in my website by using the SEARCH widget from the main menu or the sidebar (type requiem). 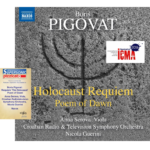 Pigovat's Holocaust Requiem may prove to be one of the three finest masterpieces ever written for viola, with the Bartók and Walton Viola concertos. It now primarily needs time and exposure and to become known in contemporary 21st century literature.